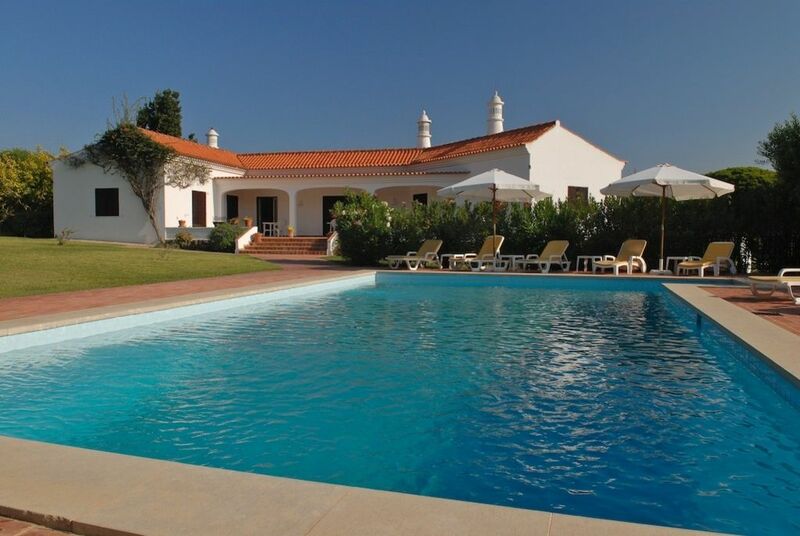 Casa Figueiras (263m²) is located on a very large, quiet, very private and fenced in piece of property, a rare find in and around Vale do Lobo. It is surrounded by a garden and orange orchard. The pool is large (6 x 12 metres) with an optional removable safety fence. There is an outside shower. The beach is only 5 minutes away by car or 15 minutes walk. The villa, on 8.000 m², has two terraces, partly shaded. The sitting- and dining-room is spacious. The Portuguese tiled kitchen has recently been modernised. All four twin bedrooms have air conditioning. All bedrooms have connecting bathrooms: two with bath, double wash-basin and toilet; two with shower, one wash-basin and toilet. Linens are provided, excl. beach-towels. Cleaning help 3x a week with change of linens 1x a week. More help is available at extra costs. There is a carport for 3 cars. The property is surrounded by fencing with a gate and is ideal for children. Lots of areas to play and hide. Removable swimming pool safety fence available at 150 Euro per week. Vale do Lobo in the Algarve is located on south coast of Portugal, known for its beautiful beaches and golfcourses. It is only 20 minutes away from Faro International Airport.